Refugees who come to The Meeting Place are warmly welcomed in Jesus' Name. 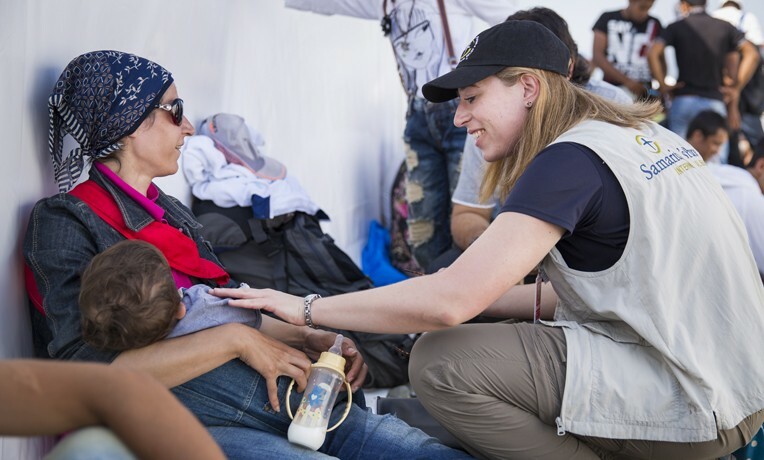 At multiple outreach centers around Europe, Samaritan’s Purse served thousands of migrants fleeing conflict and economic hardship in their homelands. Read stories of those whose lives were changed. In 2015, an unprecedented 850,000 refugees arrived in Greece by sea, facing deadly waves in small rubber boats for the chance at a better life. Samaritan’s Purse responded to this crisis by meeting some of these migrants on the rocky beaches as they came ashore. Offering blankets, food, and much needed encouragement, we cared for these refugees in Jesus’ Name. Migrants at The Meeting Place connect with others from their home country. In addition to working in the squalid camps that developed, we also set up a welcome center in Greece and then more across Europe as many refugees left that nation for other countries. We called each of these centers by the same moniker: The Meeting Place. At these outreach points, migrants fleeing their conflict-ridden homelands are welcomed with a cup of tea, some cookies, free wi-fi, and language lessons. Staff who speak their language and understand their culture help newcomers navigate their surroundings and understand the process of obtaining asylum. Since many of the migrants left behind a close-knit network of extended family, The Meeting Place also offers social opportunities for them to connect with others from their home country. The staff organizes soccer matches, chess tournaments, mother and toddler gatherings, as well as Bible storytelling times, to help migrants create community in a new place. Samaritan’s Purse initiated each of these outreach centers with the express purpose of loving migrants and sharing the Gospel with them in their time of need. Partnering with local churches, we served many tens of thousands of migrants from Nov. 2015 to Mar. 2018. More than 40,000 of these people heard the Gospel, and 1,043 received Jesus Christ as their Lord and Savior. Many of them come from Muslim-majority nations in the Middle East and South/Central Asia. One professor from a major university in the Middle East lived in the uncertainty of constant terror and fighting in his city. He daily found unidentified bodies on the side of the road and personally received a death threat in 2013. He and his wife and five children persevered amid this strain for two years until they fled for safety to another country in their region. The family, however, dispersed in the process, with some members traveling by boat to Greece. As they sought asylum, their eldest daughter received a permit to work as a medical doctor in Denmark. The family soon reunited there for the first time in years and the youngest two sons came across The Meeting Place. As God moved on their hearts through the teaching and activities, they both were saved by grace through faith in Jesus Christ. In time, the other family members believed as well and were baptized. All seven are now being discipled at an international church. One woman who came to The Meeting Place in Sweden was the former wife of a Muslim cleric. On her migrant journey, just one year after her divorce, she met a pastor who shared with her that Jesus was not just a prophet, but the Son of God. The Meeting Place prepares for an Easter celebration. After learning this, she couldn’t sleep and heard voices telling her to remain true to Muhammad. Still intrigued, she secretly sought Christ while her Muslim heritage haunted her—according to Islam, becoming a Christian is considered apostasy and carries the death penalty. One day, as she walked down a street in Sweden, she felt a tap on her shoulder. Turning around, she saw a white church nearby and heard a voice say, “I am Jesus—enter this church.” She didn’t enter it, but the next day she visited The Meeting Place and prayed to receive Jesus Christ as Savior and Lord. In March 2018, a staff member from The Meeting Place in Greece visited a local church comprised of migrants. He went together with two believers who had recently come to Christ at the outreach center. His intent was to introduce them to this fellowship of believers who shared their nationality. During the service, the pastor said, “Raise your hand if you heard the Gospel at The Meeting Place or have been blessed through that ministry.” Nearly 100 hands went up—almost the entire congregation. As The Meeting Place centers in Austria, Denmark, Germany, and Sweden continue to thrive, we are handing over operations to local church partners who will continue the work. Our center in Greece will remain open as well and transition to national leadership in the fall of 2018. Please pray for the thousands of migrants who come to The Meeting Place. Pray that they will know and experience God’s love. We rejoice that God is redeeming this human migration for His purposes. Though the circumstances may be heart-wrenching, He is bringing those with less access to the Gospel to places where they can freely hear the lifesaving news of Jesus Christ. Because of The Meeting Place, migrants can say, “we hear them speaking in our own tongues the wonderful works of God” (Acts 2:11). In addition, churches in Europe are being stirred to bold faith in the process. The Meeting Place is providing congregations an opportunity to reach out to the stranger in their midst. As migrants come to faith and join them, waning fellowships are now growing and gaining fresh vision.